Barcelona is a city with a lot to see, and there’s no real better way to see it than from above! From these different viewpoints you can spot some of the world’s most famous architecture, marvel at Barcelona’s fascinating grid system and really appreciate the magnificence of this city. This modern hotel right in the heart of Barcelona’s trendy El Raval district is home to a 360 degree terrace offering some of the best views in the city. Hotel guests can swim in the beautiful rooftop pool while the public are allowed to visit the rooftop after 6pm to enjoy the sunset. The world famous Plaça d’Espanya is home to one of Barcelona’s former bullfighting arenas – converted in 2011 into one of the city’s most sought after shopping centres. From the roof you can see unbeatable views of the square and the Palau Nacional, even catching a glimpse of the magic fountain. One of Barcelona’s most visited attractions is also home to one of the best views of the city. Originally designed to be a garden city, Park Güell has become Barcelona’s most famous green space home to some of the city’s finest modernist architecture. From the park you can see most of the city’s most famous landmarks, including La Sagrada Familia and even as far as the beach! La Pedrera or Casa Mila is one of Gaudi’s most famous designs. Situated on the upmarket Passeig de Gracia, a trip to the house gives you an insight into Gaudi’s design ideas and methods as well as access to the roof, where you can marvel at the amazing modernist chimneys and admire the amazing unique view of the city. 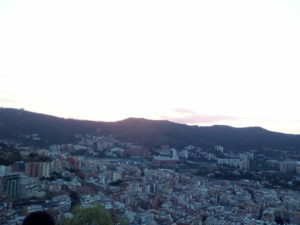 If you fancy a small hike with a great view, few places in Barcelona offer a view as spectacular as los bunkers. The bunkers, built during the Spanish civil war to defend the city against air raids, are now home to a small free museum and a 360 view of the city, from where you can see almost anything. Head up there for sunset or sunrise (if you’re an early riser) and bring some wine to settle in with the locals and enjoy the amazing landscape of the city as another busy day in Barcelona draws to a close.